The last couple of trips had been a bit uneventful so things were due for a shake up and, by golly, that’s what they got on this one. Things started out well enough – the sun was shining, I was on the road early and, as I didn’t have too many miles to cover, would hopefully be home again by mid-afternoon. Once again, I took the M8 out of Glasgow, then joined the M80 to the junction with the M876 which took me over the Kincardine Bridge to the ancient Kingdom of Fife. It wasn’t as sunny here, in fact, it was quite overcast and hazy which obscurred the views, nevertheless, I wanted to see what I could, so I followed the Fife Coastal Tourist Route (B9037) past the rather unsightly Longannett Generating Station on to the gorgeous village of Culross. 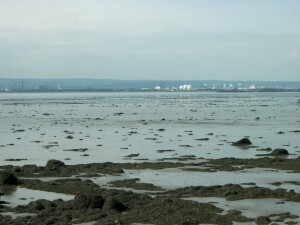 From here I could see the refineries of Grangemouth (that I’d passed on Trip 3) on the other side of the Forth estuary. 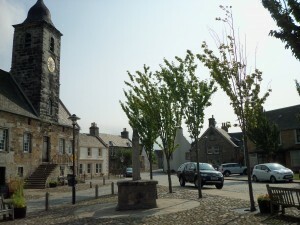 Leaving Culross behind, I continued along the tourist route towards Inverkeithing. 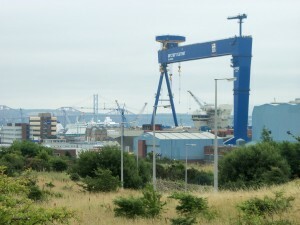 Suddenly, I saw the massive crane of the Rosyth Naval Shipyards towering over the horizon. Man, that thing was collosal and deserved a closer look. 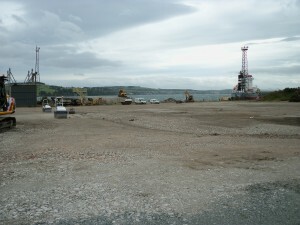 Rounding the headland, the whole shipyards lay below me with the Forth Rail and Road Bridges poking up behind them. It may not have been pretty, by my goodness, it was impressive. Three of man’s huge constructs in such close proximity. At Inverkeithing I planned to start making my way north to Tayside. This is where things started to go downhill. It was slow-going along the coast road and the haze was getting thicker, spoiling the view and I was starting to wish I’d gone north via Dumferline instead – a faster road. As I came into Kircaldy I got stuck in a huge queue of traffic caused by a set of roadworks. Finally clearing these, I made my way along the Esplanade, then got stopped at another set of lights. Just as I was thinking what an unattractive town it was, I suddenly felt a hand on my shoulder and almost jumped out of my skin. It was the man from the car behind me. “Did you know your back tyre is flat?”, he said. “What?”, I replied, not quite believing him. As soon as the lights changed, I pulled over and, sure enough, it was flat. Now, it’s either a testament to my superior riding skills or a sign of my complete lack of sensory awareness, that I hadn’t noticed this. Either way, there was only one thing I could do. I whipped out my foot pump and started pumping. 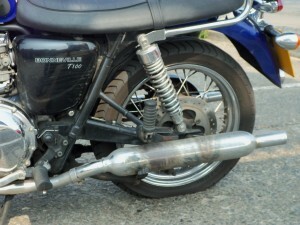 Five minutes later it was still flat as a pancake so I asked the man who had just come out of the pub if there was a Kwik Fit nearby. He directed me back up the Esplanade. Unfortunately Kwik Fit don’t fix motorcycle tyres, so I had to call the AA who immediately advised me they wouldn’t be able to fix it either and that they’d have to tow me back to Glasgow, I’d just have to wait 2 hours for the recovery vehicle to arrive. While I waited, the Kwik Fit mechanic offered to pump up the tyre. Once he’d done this he said “I can hear it leaking,” but it wasn’t coming from the tyre but from the where the spoke met the wheel. How the hell had that happened? 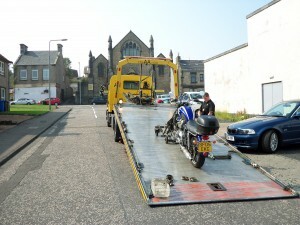 Two hours later, the AA duly arrived and winched my bike onto the back of the tow truck. David, the driver, strapped it down securely and we set off for Airdrie, where the plan was to leave it at the garage I usually used. When we got there, however, not only was the garage closed but the entire truck yard in which it was located, was also closed and gated shut, so, even though he wasn’t supposed to, David then took me all the way back to Glasgow (what a hero!). By the time we got back, unloaded the bike, and I then got the train home, it was 7.30 pm. So much for a nice short day. After the bike got dropped off, I contacted a mobile motorcycle service (www.mobilemotorcycleservices.co.uk) I’d seen around and Gordon, the owner, came and took my Bonnie away for repair. A couple of days later, it was back, with a new inner tube and looking none the worse for its ordeal. In fact, Gordon had even washed it down for me, so it looked beautiful and shiny. Top service! I’d been really pissed off about having to cut this trip short and it was a real battle with myself to get going and finish it off. It was cold and windy outside and I hadn’t really planned on riding this weekend, so it took a supreme effort to get out of bed and head over to my friend’s to pick up the bike. Once I was on the road though, I felt a lot better. I took the back road (the A811) from Milngavie up to Stirling as I didn’t want to retrace my steps from last week. 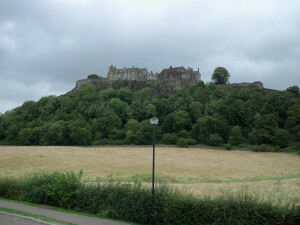 Arriving in Stirling, I could see the castle on the hill – what a magnificent sight. 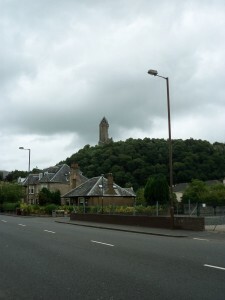 Not much further on is the Wallace Monument, another fine piece of architecture. From here I picked up the A91 east. It’s a beautiful road through lots of charming villages and farmlands and next thing I knew I was filled with joy. 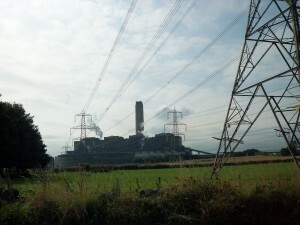 At Milnathort I had the option of joining the M90 to Perth and then on to Dundee, but where would be the fun in that? Basically, I was a back road rider, so I continued on the A91. 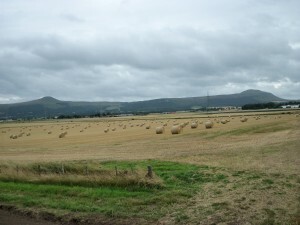 Just after Auchtermuchty (another great Scottish placename), I stopped to take a photo of the one of the many fields that had been harvested. On returning to the bike, the pressing need that had been building for some time, suddenly felt like it needed to be relieved. Now, Scotland is full of beautiful villages, but providing public toilets is something it’s not so good at. I found a bush (which, judging by the number of paper hankies behind it, several others had found too) and squatted down. And just as I let go, wouldn’t a car pull in!!! Concluding my business, I zipped up, wandered past the couple, said “Afternoon,” as if nothing had happened, and rode off. A few miles further on I turned onto the A92 and followed it over the Tay Bridge to Dundee. It’s not a high bridge so you feel quite close to the water and given how windy it was, it was quite scary riding across it. To my left I could see the Tay Rail Bridge but there was nowhere to stop and take photos. Arriving in the city, the whole waterfront was built up and I had to ride some way out of town before I could find a vantage point. 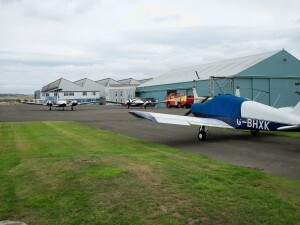 I didn’t hang around Dundee and followed the A90 north to Tealing where I tool a back road west to Coupar Angus and joined the A94 to Perth. This took me past Perth Airport at Scone, a place I’d worked back in 2001. After Perth, where I could have taken the A9 south, I decided to continue west on the A85 to Crianlarich. By Crief, though, it was getting really cold and the thought of going all the way down the side of Loch Lomond home seemed far too far, so I took the A822 south back to the A9. At Dunblane the A9 becomes the M9. 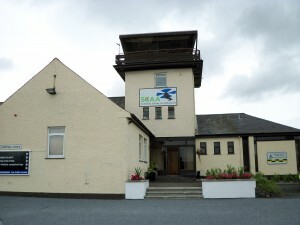 By now, it was blowing a gale and I didn’t want to get blown under a truck, so I came off at Stirling and went back the way I’d come – on the A811 to Glasgow. I’d covered 269 miles/432.9 km on this trip which meant I only had 533 miles/857.5 km to go to complete my 5,000 km. One more trip should do it. This entry was posted in 5K for £5K on September 2, 2013 by admin.